Three works included on this album were written in 2016: Da pacem, Domine, premiered on Vasks’ 70th anniversary programme, is according to the composer, a powerful “cry of desperation for our times, a prayer for our mad world. I believe that music strengthens our faith, love and soul.” Mein Herr und mein Gott is a work inspired by a solemn meditation written by a 15th century Swiss mystic Nicholas of Flüe, also known as Brother Klaus. The work was premiered at the annual International Sacred Music Festival, organized by the State Choir ‘Latvija’ and conductor Māris Sirmais. The lyrics of Laudate Dominum, the title piece of the album, consist of only one sentence which is repeated by the choir. The choral texture of the work alternates with majestic organ episodes. The remaining two works in the album are based on texts by Mother Teresa: The earliest of them, Prayer (Lord, open our eyes) was written in 2011. The second, The Fruit of Silence (2013), was written for the Schleswig-Holstein Music Festival. For Vasks Mother Teresa is “an endless source of inspiration”, as well as “an example of true Christian love, speaking through actions, not mere words”. 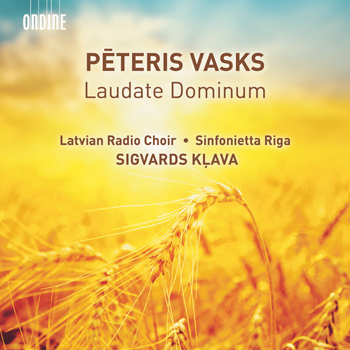 The releases of the Latvian Radio Choir on Ondine have been highly successful. For instance, the recording of Rachmaninov’s All-Night Vigil (ODE 1206-5) was chosen as the Record of the Month, Editor’s Choice and received a nomination in the Gramophone Awards in 2013. Also, their recent releases of choral works by Valentin Silvestrov (ODE 1266-5) and Eriks Esenvalds (ODE 1247-2) received Gramophone Editor’s Choice.